In a new study published in Anesthesia Progress, researchers test two commonly used local anesthetics to determine their levels of neurotoxicity. The researchers found the results of the study to be surprising and contrary to their original hypothesis. The overall study results found that articaine did not cause increased neurotoxicity or delayed responsiveness in human-derived cells as compared with lidocaine. Anesthesia Progress – Dentists heavily depend on using local anesthetics, such as lidocaine and articaine, to help control pain during procedures. It has been reported that articaine could have some adverse effects on the patient in the form of prolonged paresthesias and increased neurotoxicity after the procedure as compared with lidocaine. Recently, researchers from the University of Pennsylvania published a study in the current issue of Anesthesia Progress that compared the neurotoxicity levels and sustained length of the anesthetic block caused by both articaine and lidocaine. The researchers performed an in vitro study in which human-derived cells were tested with dental-grade concentrations of articaine and lidocaine. To test the neurotoxicity, the cells were exposed to each drug for 5 minutes, washed and then exposed to the Live/Dead cell assay for 30 minutes, which determines viability of cells. To test the recovery time, experiments were designed to examine depolarization 30 minutes after treatment with the drug and how quickly the cell was responding after being exposed to the anesthetic. To confirm their results, the researchers used exactly the same methods of testing using the pure, powdered form of each drug to ensure that any additives to the dental-grade drugs were not affecting the outcome. The researchers found the results surprising. Contrary to their original hypothesis, it was found that the neurotoxicity levels in dental-grade articaine and lidocaine were similar, but the pure lidocaine appeared to have increased neurotoxicity compared with articaine. This was surprising as some retrospective clinical surveys seemed to indicate that articaine may be more neurotoxic than lidocaine for dental nerve block. Regarding prolonged post-procedural drug effects, lidocaine was found to have a reduction in cell responsiveness after 30 minutes, again contradicting the original hypothesis and previously presented study data. The overall study results found that articaine did not cause increased neurotoxicity or delayed responsiveness in human-derived cells as compared with lidocaine. Although lidocaine did create a more delayed post-procedural responsiveness, the researchers’ stress that there is no indication that lidocaine is unsafe or should create cause for concern; it has been well documented as a safe anesthetic in the dental clinical setting. The most important conclusion is that articaine is no more neurotoxic than lidocaine in this in vitro study. 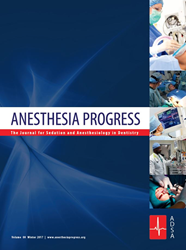 Anesthesia Progress is the official publication of the American Dental Society of Anesthesiology (ADSA). The quarterly journal is dedicated to providing a better understanding of the advances being made in the science of pain and anxiety control in dentistry. The journal invites submissions of review articles, reports on clinical techniques, case reports, and conference summaries. To learn more about the ADSA, visit: http://www.adsahome.org/.